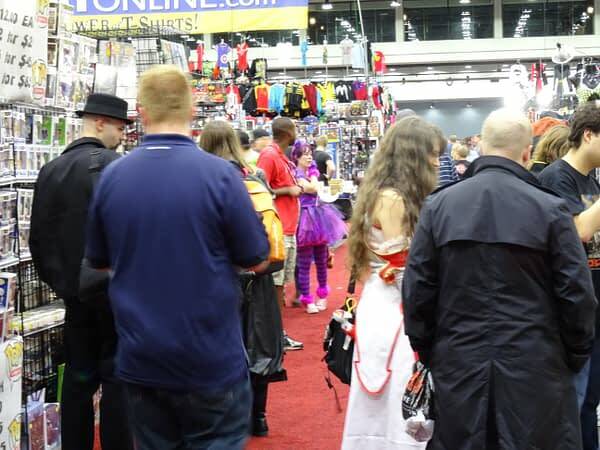 If crowded hallways and customer-filled vendor booths were any indication, this year’s Cincinnati Comic Expo was a huge success. When I arrived at the show, the first thing I did was find Adam West’s line, to get the worst of the waiting over with. Mr. West’s autograph is not inexpensive, and since Saturday was West’s 87th birthday, I’m not sure how many more public appearances are in his future. By the look of him, many, many more! Finding the end of his autograph line (halfway across the exhibit hall), I settled into what looked like an hour wait. 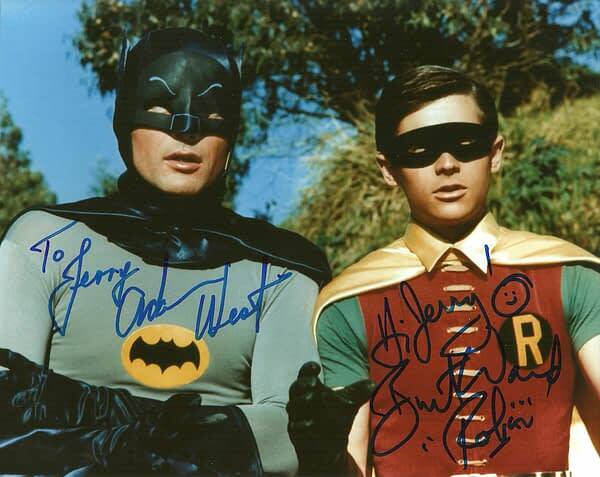 I planned to choose a two-shot photograph of Batman and Robin from West’s table and have Burt Ward (Mr. Robin the Boy Wonder to you) sign it as well. There is a camaraderie that develops with folks standing in line at cons, and immediately around me were a twenty-something man who loved Batman and an older woman there by herself. We each shared our stories and hers was unique. Her name was Barbie, she was an attractive retiree from Northern Kentucky. She grew up with the Batman TV show and was going to the Cincinnati Oktoberfest after the comicon. She knew nothing about comics, comicons or Batman in general. But she wanted to meet Adam West. When she heard how much autographs were, she became worried and started to panic that she would be forced to buy one. I reminded her it was still America, and we’re not forced to buy anything here but health insurance. She was visibly upset and concerned that her idol would force her to purchase a photo. As we moved slowly but surely through the line, she asked each security volunteer if she would be forced to buy something. They all said no, but she was still sweating it out. She saw that West and Ward were sitting in close proximity, and hoped to talk to both of them at the same time. It broke my heart to tell her that Ward was a separate line and separate table. In about 50 minutes we reached West. She nervously stepped up to West’s assistant and explained she just wanted to say hi. He said that was fine and you could see the stress and nervousness fade a little. She stepped up to West and they exchanged some pleasantries. Mission accomplished! She walked off and I never saw her again. I guess Burt Ward’s line was too much stress to attempt. What if he tried to force her to buy a photo? I approached West’s assistant and chose a Batman and Robin photo. “What’s your name? he asked. “It’s Jerry, but he doesn’t have to personalize it.” I said. I politely asked, “So you charge that much for a signature and I can’t get it the way I want it?” He looked apologetic, but basically said yes. Let me digress … for those that don’t know, eBay and other auction sites have changed the way people disperse, handle and sell collectibles. Many flippers and speculators take art, sketches and autographs obtained at shows and immediately try to flip them on auction sites for as much money as they can get. Stars and artists want to keep the money for themselves and control those interactions as much as possible (as is their right). A personalized autograph is harder to sell, so some, not all, celebrities personalize their signature, whether you like it or not. Again, that’s their right, but West was charging so much for his signature, what does he care? 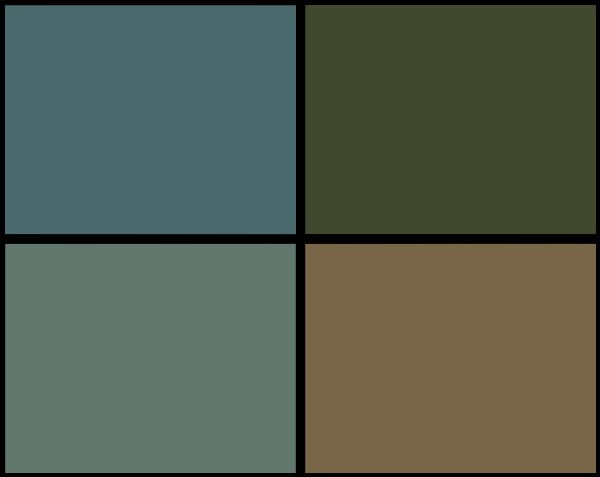 I thought that was a bit mercenary. I have no intention of ever selling the photo, but it should be the customer’s choice. He burst out laughing, which seemed genuine. “Yes, they really took advantage of me on that one!” he said. I wandered off with my photo, knowing I’ll never meet him, or deal with those lines, again. Nice guy though. By the way, Robinson Caruso on Mars was a mediocre sci fi movie from the ‘60s that West was in for the first five minutes. After Batman hit huge, every time the movie was shown on television West got top billing … “Today, Robinson Caruso on Mars starring Adam West!” I’m sure he got a kick out of that situation. Sorry, digressing again. After that, onto another 40 minutes in Burt Ward’s line. He signed the Robin part of the photo, again, personalized—I guess now I’ll never forget my own name. 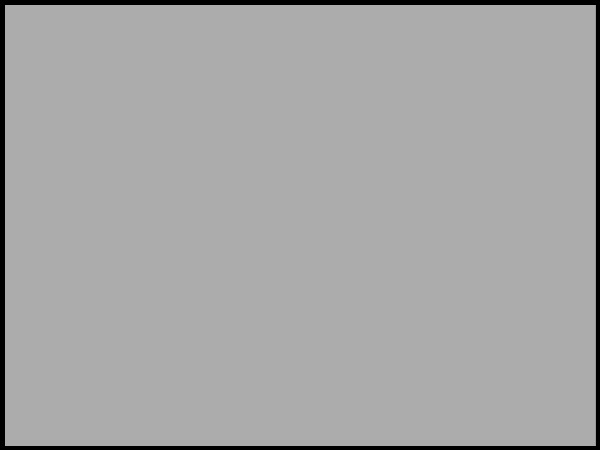 We discussed the recent Batman release on Blu-ray and how the studio put millions into restoring the film and colors. That will be fun to watch. 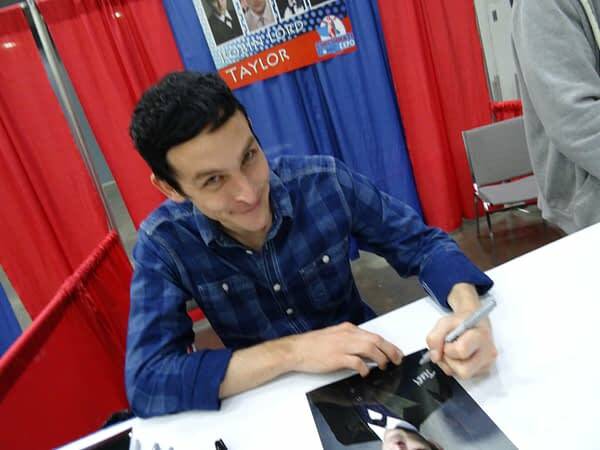 The only other autograph I wanted to get was Robin Lord Taylor, who plays Penguin on the Gotham TV show. He turned out to be an incredibly nice fellow. He mentioned some of the dastardly awful stuff coming up on Gotham this year and how much he liked his co-star Carol Kane. He also posed for photos with any and all fans free of charge. Again, celebrities have every right to charge whatever the market will bear for such items. But it was great for a young actor to be so generous with his time. 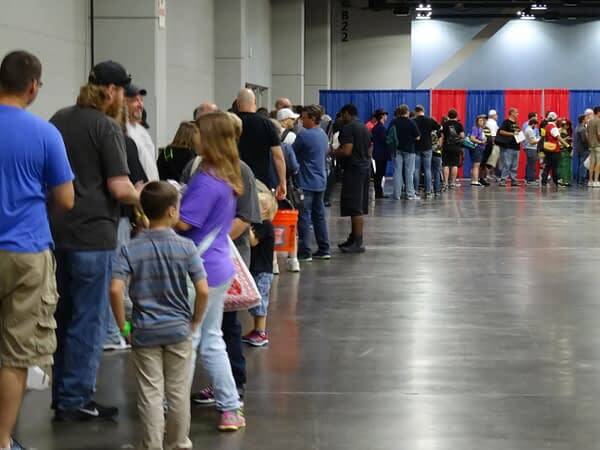 There were many other celebrities in attendance, and no one seemed to have long lines to meet them. Steve Guttenberg was there, I think someone hired him to do their daughter’s birthday party. Kidding! Katrina Law was there from Spartacus and Arrow, radiating beauty. Ian Ziering was standing around not getting much attention. If his photo were $10 I would have gotten one just for the irony value. But—it wasn’t $10, so I made do. Next was a panel hosted by the greatest comics artist ever, Neal Adams (just ask him. And I wholeheartedly agree!) I met up with my friends Matt, Ted and Todd to see Neal. Neal sat at a table, in a room filled to capacity, without water or a microphone, and entertained people for 40 minutes. He started out with the story of how he almost died in an ocean riptide (a fascinating tale of how he bodysurfed to safety). He then addressed how he got into the comics business. He made it clear that the business is run by “crooks” and the publishers are “stupid,” but further went on to say it’s “our” stinking dirty business and a lot of those publishers are his friends. He spoke about what editors and writers he enjoyed working with as an artist. These insights from someone who has been in the business so long were informative and entertaining. He then charged everyone in the room $20. Kidding! The only comic I brought for an artist to sign was Darwyn Cooke’s Absolute New Frontier. I loved that story and Cooke’s art and had never met him. I finally caught him in the afternoon, when he was returning after a break to a short line. I told him how much I loved his work, and the illustrations he does for the reissues of Richard Stark’s Parker novels. I asked him if he would make his way through all of Stark’s novels—unfortunately he said he probably wouldn’t live that long. That’s too bad—work that good should bring more attention to those excellent semi-forgotten crime novels. After a brief lunch, onto the comics. Despite the growing crowds, the comics section of these events grows smaller every year. Fewer dealers return, bringing fewer obscure items and rare, low-value comic titles that are so hard to find. Deals and discounts are also getting harder to find, which is a mixed blessing. When the economy was bad, dealers were liquidating even valuable books and everything was on sale. I’m glad the economy is doing better, but now almost everything is full retail and pricey. Despite that, I did make some finds, including a Giant-Size Master of Kung Fu #2 in mint for $3.00. I filled many other gaps in my collection with issues from books like Green Lantern, Captain America and Fantastic Four. I found a beautiful Avengers #14 for a reasonable price from my home retailer, Paul Mullins of Comic Book World in Florence, KY. I even found a cheap Giant-Size Man Thing #1, a book I’ve always wanted. I’m not a particular fan of the character, but you gotta love that title. 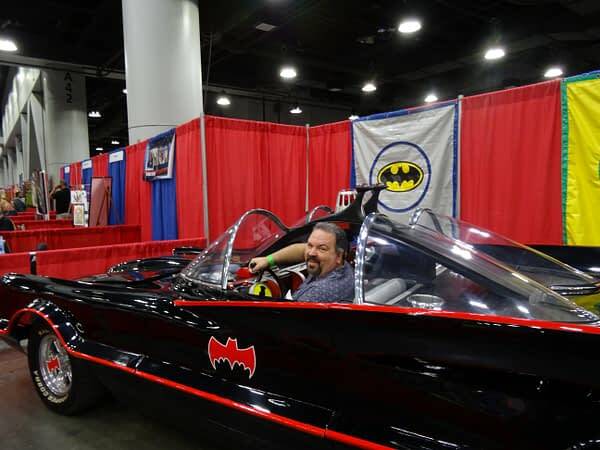 I finished the day with a few photos in the Batmobile. The Bat-Cycle and Bat-Copter were also present, but cost too much to take photos of. Mercenaries! Overall, the Cincinnati Comic Expo is well organized, with fun events and interesting guests. I’d love to see more panels and more comic book dealers, but I will gladly head back next year. Jerry Smith is a Sales Rep and Freelance Writer from Northern Kentucky, USA. Check out his blog Humble Opinions about comics and pop culture at: http://jerryshumbleopinions.blogspot.com. Geek Fuel Subscription Box Is Worth It Just For The T-Shirts!